Some people are sports nuts and will watch any and all sports year round for the sake of watching something. I’m not one of those people. Hands down, my favorite sport to watch is football. More precisely, NFL games. I’ve patiently endured the long off season and pre-season games in anticipation of the 2015 NFL Kickoff. Now that football season is finally here, I can’t wait to start watching all the games. Especially my beloved Broncos games. Even though we’re not in Colorado anymore, I’m a Broncos girl through and through and invest in an NFL Sunday Ticket subscription every year to ensure I don’t miss a game. While football season is awesome in and of itself and I could gladly eat chicken and rice while watching a game, I like to indulge a little while watching games. The recipes don’t have to be particularly sophisticated, they just need to be simple and make my taste buds dance (like the 20 Football Tailgating Appetizers in this $0.99 ebook). Growing up, I have to admit I was not a fan of hotdogs. As un-American as this may seem, not only could I not get over the thought of what comprised a hotdog but the flavor always stopped me in my tracks. It wasn’t until a couple of years ago that I actually started liking hotdogs and dare I say, craving them on occasion. What caused the change? My husband introduced me to Hebrew National. While I wasn’t a fan of hotdogs and never even purchased them, my husband still had a taste for them and after 12 years of marriage was on a mission to make me like them too. Even just a little bit. These days I’ve remained loyal to Hebrew National and if I order a hotdog at a restaurant, I can tell right away if I’m eating a Hebrew National hot dog or another brand. After two years, one of my favorite ways to eat hotdogs is topped with lots of spicy peppers, but with little ones to prepare dinner for too I can’t make it all about the peppers. Since my girls adore taco night, I decided to mix things up a little and create a fun spin on one of our favorite meals and thus this Taco Hot Dogs recipe was born. Cook hotdogs on the grill. Meanwhile mix refried beans with taco seasoning and heat in the microwave. Once hot dogs are cooked, remove from heat. Prepare bun by spreading a generous amount of refried beans and topping with hot dog. Load your hot dog up with your favorite taco toppings such as guacamole, black olives, onions, and tomatoes. This recipe is perfect for homegating with just the family or inviting friends over for a party. 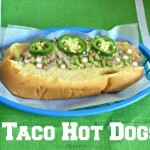 You can customize these taco hotdogs with all of your favorite toppings and ensure that everyone is happy. You’ll never regret watching the game at home instead of fighting the crowds when you make delicious food at home! 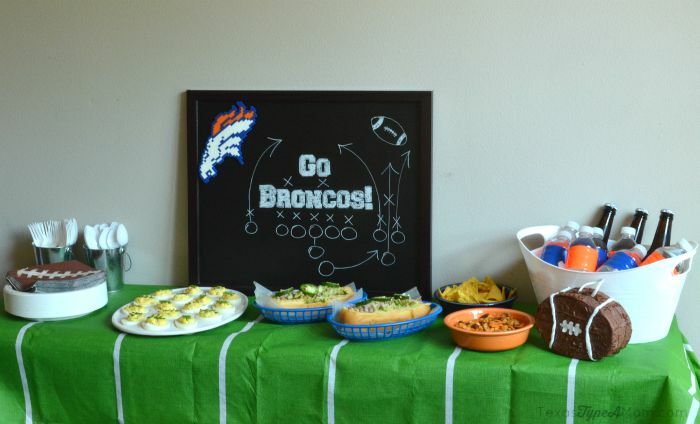 Check out these awesome football party decorations on Amazon. 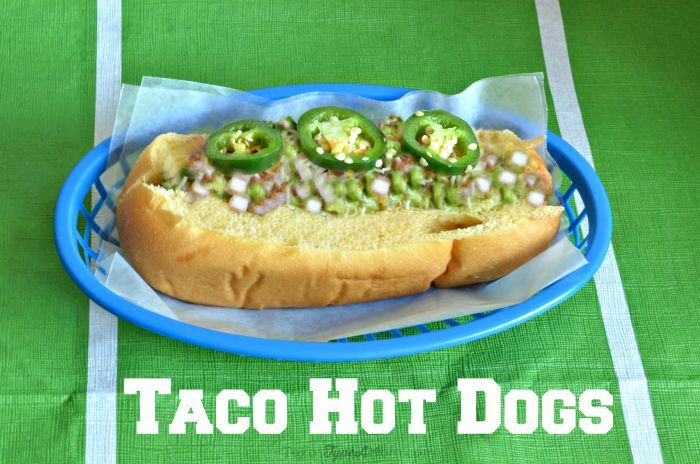 Have you ever tried taco hotdogs? What are your favorite hotdog toppings? Now THAT is a hot dog! I could go for one of those!